How to Remotely unlock T-Mobile USA Samsung Galaxy Avant, so that you can use it with any GSM carrier. We 100% guarantee that your samsung will be permanently Unlocked status in t-mobile database for lifetime. 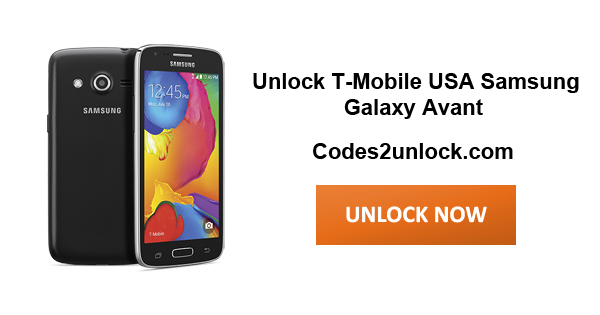 Codes2unlock.com is proud to announce that we are the direct source for Unlocking Samsung Galaxy Avant T-Mobile USA. We provide a fast, easy and secure way to unlock with LOWEST PRICE GUARANTEED. After unlocking you can use it with any gsm network. *Important Note -Please make sure that your Samsung Galaxy Avant is must activated with the network it is locked to. you must be able to access home screen of your samsung. if you have not activated your phone yet please activate or first use with the original network. 1. Samsung Galaxy Avant Unlock Confirmation on your email. 2. Samsung Galaxy Avant Phone Unlocking Instructions on your email. 3. Start the app and select "Permanent Unlock"
4. The phone will check the status from the server and reboot - Done!. 5. Your Galaxy Avant T-Mobile is now Permanently unlocked! Unlock your Samsung Galaxy Avant in just few steps with our easy to use unlocking instructions.